Under the Big Oak Tree: Join Ebates Today: start earing your BIG FAT CHECK! Join Ebates Today: start earing your BIG FAT CHECK! 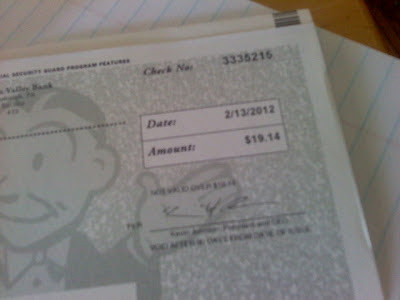 I know that I've shared my love for Ebates with y'all before, but since I just received a BIG FAT CHECK from them today! This check was cash back for online purchases that I made over the holidays. Gotta love getting a little something back after the holidays, huh?! Last spring, I shared with you how I helped my mom save $40.20 by looking for the lowest price, then logging into Ebates before placing her order! Over the holidays, I was at the mall with a friend. I only left the house with a small amount of cash and didn't bring my debit card either. In the Disney Store, I saw a few things ON SALE that I knew we wanted to get Grace for Christmas. My friend knew I didn't have enough cash with me and offered to buy the wanted items and I could pay her back later. That was tempting, but instead, I bought one item while we were at the mall and decided that I would check online when I returned home. I was so glad I waited. The online sale was better than the in-store sale! I logged-in on Ebates to check out the percentage and at the time it was double Disney.com's normal percentage! To top it off, Disney.com was offering free shipping that weekend! I was so pleased with myself! Next week, we're driving into the city to get our taxes done. Thankfully, we're expecting a return! As with past years, we'll be making some purchases for items for the house. I plan on using Ebates as much as I can! These days, every little bit of savings helps! And that is why I want to invite you to join Ebates today and start earning your BIG FAT CHECK! If you sign up using my referral link, I'll earn a bonus only after you make your first qualified purchase.